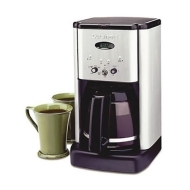 alaTest a collecté et analysé 55 avis de consommateurs et d'experts pour le produit Cuisinart Brew Central 12-Cup Coffee Maker. La note moyenne du produit est 4.4 sur 5, tandis que les autres produits de même catégorie ont une note moyenne de 4.2 sur 5. Les testeurs apprécient la taille. Après analyse des notes de consommateurs et d'experts, de l'âge du produit ainsi que d'autres facteurs, et comparé aux autres produits de même catégorie, le Cuisinart Brew Central 12-Cup Coffee Maker obtient un alaScore™ de 83/100 = Très Bien. One of the best coffee makers I've ever had...it's quick, keeps coffee HOT and it brews delicious joe! My only complaint would be that the programming feature doesn't work on mine but its such a hassle to return it I'm living without it. I love it.. Makes a great pot of coffee.. No complants what so ever.. Easy to fill with out mess like other makers, Pot size is great, we would always have to make extra coffee because of coffee pot size but this is true 12 cup.. Love it. I have bought 3 of these coffee makers and every one of them went out in just a few months time. The on/off switch always had a problem. I would not invest in another one of these...they are junk! Goodbye, Mr Coffee! You have been replaced with a wonderful coffeemaker, that does not leak at all. It brew's great coffee, and the red brightens up my kitchen. I am very happy with this purchase! My mother has one, and so does my sister. I bought myself one and the coffee is amazing. I am done with the cheaper coffee makers. It is so true you get what you pay for. This coffee maker is worth every penny.